1.14.16 - Protect Your Pets & Save Dogs! Have you ever lost a pet or even worried about losing one? The key to making sure your pet comes home safe is by making sure they have proper identification. Tags for Hope has created a fantastic product to make sure your dog is never lost (again). Their well-made, very informative dog 'license' tags are a must for dog owners. Not only would you be buying something to protect your pet but your purchase will also support a dog in need. All purchases made through this link will give RUFF 25% of the sale price. This will go such a long way to help us take care of the dogs we have and allow us to rescue more. Please consider buying a Tags for Hope ID Tag. A HUGE THANK YOU TO TAGS FOR HOPE FOR GENEROUSLY MAKING A ONE TIME DONATION TO RUFF. THIS DONATION WAS IN ADDITION TO THE AMOUNT RECEIVED FROM TAG PURCHASES. WE ARE SO VERY GRATEFUL FOR THEIR CONTINUED SUPPORT. Shop Amazon.com, Help the dogs! We have found another way for anyone to help with donations that doesn't cost you anything but a couple of clicks on our website. RUFF is now a participant in the Amazon Associates program which allows the rescue to earn a percentage of sales from purchases made on Amazon.com. If you purchase anything from our Amazon Link and you access their website from our website, they will donate a portion of your purchase to our RUFF Rescue. This is a really easy way for you to help provide funds for the dogs, just by doing your regular shopping. For those of you who would like to buy supplies for our dogs, we also have an Amazon Store that lists various items that we desperately need. You can purchase these items, have them shipped straight to us AND we will earn a percentage of your purchase. We would appreciate you taking the time to remember RUFF the next time you want to make a purchase at Amazon.com, just remember to click our Amazon Link first. We only receive the proceeds if you click this link; there is no way to add us later in your purchase. God Bless you for your kind support. We want to thank everyone who has been so kind to help us keep our shelter doors open these past years. Without your help over 2300 dogs would not have lived and found a loving home. YOU are beautiful. Unfortunately, we cannot continue to keep our doors open without your help. We presently have 33 dogs at the shelter that need food, medications (these are very expensive prescription meds), flea preventatives, heartworm preventatives, Clorox, trash bags and treats. We use canned pedigree pup food to give meds to the dogs and we have one little dog who must eat canned food due to her teeth which are not strong enough for hard food. We need power to run the washer/dryer, fans, air conditioning when it is extremely hot and heat when it is extremely cold. Please be there for these dogs. I donate all of my time (and have since 2004) for the physical work and the office/computer work and will continue to do so until I drop. You are the key to saving our dogs. We need help financially to keep our shelter open, but we would also love to have you volunteer your time with the dogs or help us with fund raisers. All donations go directly for the care of the dogs at the shelter. Without air conditioning in the summer, the shelter can get as hot as 106 degrees inside. We only run it when the outside temperatures are above 80 degrees. We run the heat only when it gets very chilly in the winter in order to keep the dogs comfortable. This past year has been a dichotomy. It's been bittersweet. We have had so many good things happen and yet we had many things we would love to have had "do overs" but they say you learn from your mistakes so we should be very wise by now. This past year we were fortunate enough to find homes for several of our precious seniors who otherwise wouldn't have had a chance for a home. We are so thankful that there are wonderful people out there who opened their hearts and realized that these precious dogs are loving and warm spirited who only want a chance for a family of their own who will stroke them when they are lying beside them and share the love they so rightly deserve. In return for giving them a loving home, these beautiful dogs give unconditional love and they are so grateful for the chance to have something they have never been afforded before. Unfortunately, some of our adopted precious dogs were returned to us for reasons such as the owners losing their jobs and losing their homes. As long as we have a shelter, our arms are open for them to return here should the adopters not be able to keep them safe and give them a home. This year we managed through donations to have tin roofs put up over each dog's personal outside runs. This is a wonderful thing for them in that they can go outside rain or shine to enjoy outside when they wish. We managed to get the inside of the building's ceilings lowered to make the building's heating and cooling system more comfortable for the dogs. This drop ceiling was also donated. One of our nice donations was a tin roof over a portion of the large outside runs that the dogs go out to play at least 3 times a day. This keeps them cooler when they want to go outside and play and prevents them from getting wet also when they go outside to play in the large run. We are so proud to have these nice things for the dogs to make them feel more at home. Of course being in a shelter is not what we want for our loving dogs. They need a home where they are the center of attention and given that special love that only family can give. We try to make them feel as loved as possible until that home is found for them. Please let your friends and acquaintances know these dogs need a home and to please give them a chance. They are all healthy and happy dogs. They will return the love you give two fold. Donations can be made on our website under the "donations" tab. You do not need a paypal account to donate. Once you click on "donate", there is a statement that says "don't have a paypal account? Click here." The dogs at our shelter are totally dependent on your donations and of course they are dependent on the physical care we give them here. We are a non-profit no kill dog rescue shelter and we have saved over 2300 dogs since 2004. Please help us continue our work. Please consider becoming a monthly donor. God Bless you for caring and God Bless our beautiful dogs. Pray for them to get a home soon. Please Support Us! Donations Are Desperately Needed! Become a monthly sponsor - just $1 a month. See Our Dogs at Play! PLEASE HELP SAVE OUR SHELTER. WE ARE A 501C3 NON-PROFIT NO-KILL SHELTER. 179. This is the number of dogs in our possession before the BP oil spill. 49. This is the number of dogs in our possession after the BP oil spill. Since 2004 we have saved over 2,200 dogs. Our dog count has severely dropped due in part to the lack of funds after this disaster. In order to keep the doors open, we had to drastically reduce the amount of dogs we take in. While we found homes for over 100 since the oil spill, we would like to provide a shelter for countless others that may find themselves in desperate need of care. You are needed now more than ever. In order to provide a loving, nurturing shelter for these dogs, we are in desperate need of your support and donations now more than ever before. We face an immediate threat of closing if we do not meet the bare minimum amount of funding to remain open. These dogs need you now. Their lives depend on you. Below you will find a Paypal link to send in your tax deductible donation. Your donations and support determine our future as a no kill shelter. Please, find it in your hearts to spare any amount you are able to give. Your support will mean the world to our dogs, as well as ourselves. Every little bit helps. Please help spread the word via our Facebook and Twitter accounts. Thank you, from the bottom of our paws for your time, love, and support. 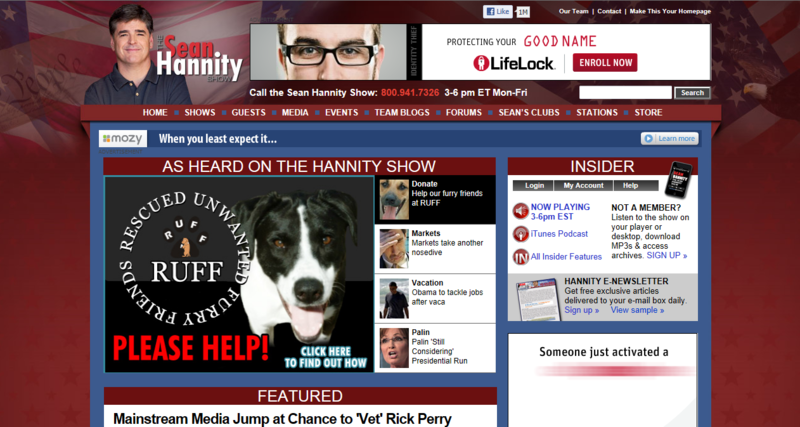 We Were Featured on Hannity.com! 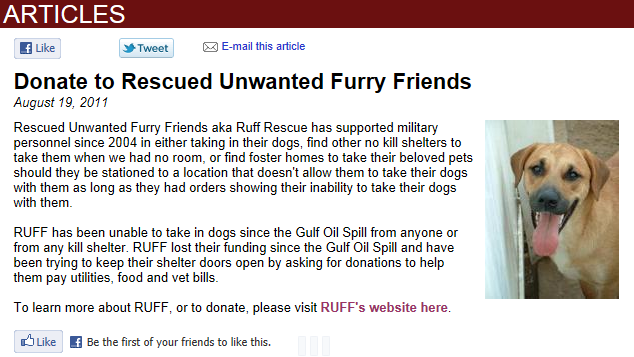 Help RUFF Dogs by Shopping Amazon.com! © 2011. All rights reserved. A special thank you to Free CSS Templates for the beautiful template!